The nightlife institution and monthly party series Good Times turns 10 this year, and will be celebrating this hallowed anniversary with a series of parties throughout 2018. For the first one at Canvas Club on 25 February, Good Times isn't pulling any punches. 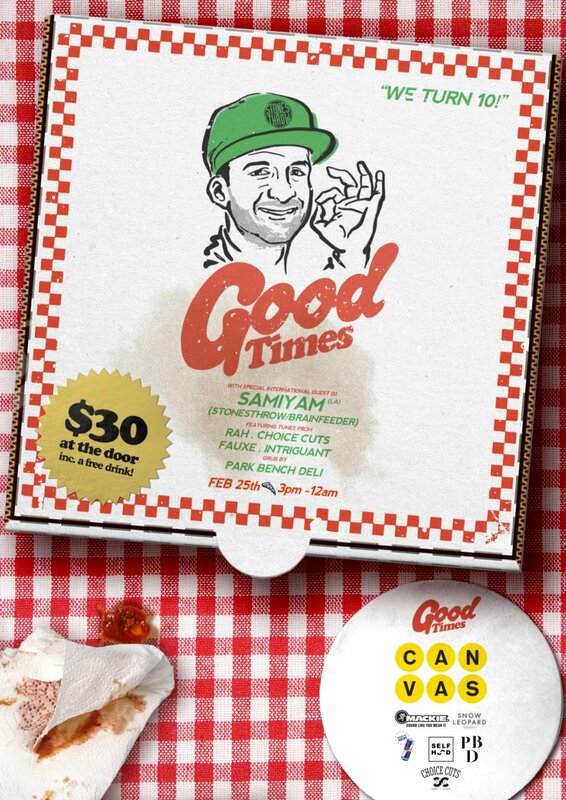 Headlining is L.A.-based producer Samiyam of Brainfeeder and Stones Throw Records, who will be playing music from his new record Pizza Party with features from Earl Sweatshirt, Action Bronson and more. The party will begin in the afternoon, right outside the venue for a day party curated by Choice Cuts that will see live sets from Drem and JNR from the Matteblacc team, and food from Park Bench Deli. One the sun sets, the party will carry on in the club, with Darker Than Wax's RAH taking over the decks before Fauxe performs a special live set, followed by Samiyam. The night will end off with a closing set by Intriguant. The party will also feature a music and merchandise market. Good Times' Party No. 1 will take place on 25 February at Canvas Club from 3pm to midnight. Tickets will be available at the door for S$30 and will include a free drink.